There have been many instances when great works have faltered under the scrutiny of critics. However, despite all of the negativism concerning the Book of Mormon and its authenticity, it continues to be placed into the hands of people all over the world, and those who embrace its teachings have had their lives transformed and testify of its power. Here are a few reasons why the Book of Mormon is so miraculous. Critics have long claimed that the Book of Mormon cannot be authentic because they purport that 3,913 “changes” have been made to the text of the first edition. Their argument is refuted, however, when the short period of time that it took to translate the volume, and the fact that it required fewer changes as compared to other translated works is considered. That in itself makes the Book of Mormon a miraculous work. The fact that changes were required is not unusual for any complex manuscript. Even Bible scholars such as Daniel B. Wallace, a professor of New Testament studies, affirms that the manuscript of the Bible “has undergone three revisions, incorporating more than 100,000 changes” (“Choosing a Bible Translation,” christianity.com). Several other tidbits of information also deserve careful consideration. First, when Joseph Smith verbally dictated the Book of Mormon manuscript to scribes, he was a 23-year-old uneducated farm boy. With the help and guidance of the Holy Spirit in the translation work, the finished result was a 588-page manuscript which had as its central theme, the Lord Jesus Christ, and it contained thousands of original phrases, brilliant doctrinal speeches, and unique names. Joseph Smith did not have the advantage of skilled editors to correct spelling, grammar, and punctuation mistakes. He relied heavily on his scribes and the typesetter to make such corrections. In fact, when the Book of Mormon was completed it was basically one continuous paragraph with little to no punctuation. John H. Gilbert, an employee of publisher E.B. Grandin, set the type and punctuated the first edition of the Book of Mormon. The 3,913 “mistakes” which critics use to substantiate their claim that the Book of Mormon is not true, are indeed minor changes such as punctuation. The fact that the Book of Mormon with its length and complexity of manuscript required so few corrections, is substantial evidence and proof that the book is of divine origin. Many critics claim that the Book of Mormon is nothing more than a book of fiction, and Joseph Smith, whom they further claim is a fraud, is its author. One internet critic paints Joseph Smith as an ignorant fraud and then says, “The Book of Mormon is no more complex than many other works of fiction, such as J. R. R. Tolkien’s The Lord of the Rings.” He failed to point out that it took Tolkien, an internationally renowned Oxford English professor, 12 years to write his classic book. It is believed that this brilliant professor knew up to 30 different languages in various degrees. He also associated daily with other renowned fantasy writers, one of which was his good friend C.S. Lewis. Perhaps no one was better prepared to write The Lord of the Rings than Tolkien. Despite his experience, at the time he finished his book, Tolkien said: “There were some frightful mistakes in grammar, which from a Professor of English Language and Lit are rather shocking” (Dennis Gerolt, “Now Read On,” BBC Radio 4, January, 1971). Contrast J.R. Tolkien’s life to that of Joseph Smith. Joseph was a farm boy. He had very little formal education. He was not afforded the opportunity to consult with professional writers and editors, or professional translators for that matter. He was only 24-years-old when the Book of Mormon was published. The entire manuscript of the Book of Mormon was produced in 63 days. And, it should also be duly noted that Joseph did not have any notes to refer to, but rather he verbally dictated the manuscript to his scribes. Furthermore, at times when the dictation of the manuscript was interrupted, he did not have bookmarks to remind him where he had left off, but yet when he returned to the work, he was able to continue as if there had been no interruption. Wright further comments in his article, “If Joseph Smith wrote the Book of Mormon, he should be considered one of the great fiction writers of all time. If he translated it, he should be considered a great prophet. 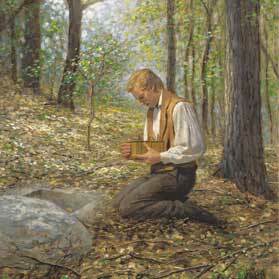 It is interesting that he receives no credit for being either from the world.” However, the substantiating evidence that an uneducated farm boy could not have written such a powerful book as the Book of Mormon, and that he was a true prophet of God, far outweighs any arguments presented by critics. On 21 September 1823, Moroni appeared to Joseph Smith and prophesied that Joseph’s name “should be had for good and evil among all nations, kindreds, and tongues” (Joseph Smith—History 1:33.) Most people who are able to obtain international fame or power in their lifetime are usually thought of as being good or evil, however, Joseph Smith is remembered as being both good and evil. What horrific crimes did Joseph Smith commit to be viewed as evil? Perhaps his “crime” was similar to that of William Tyndale, who infuriated both the religious and political authorities of his day by translating the Bible into English. Because of his actions, Tyndale was condemned as a heretic and executed. Joseph Smith, like Tyndale, also translated into English an ancient religious record that boldly testifies of Jesus Christ. Many political and religious leaders of his day also considered this heresy. As a result, they vehemently spoke against his character and his work, they unjustly persecuted him personally and legally, and some ultimately took his freedom and his life, fulfilling Moroni’s prophecy. The Book of Mormon is exactly what its title proclaims it to be, Another Testament of Jesus Christ. The book was never intended to replace the Bible, but rather to complement the Bible in its doctrines and principles. Like the Holy Bible, the Book of Mormon is a powerful testimony that Jesus is the Christ, the Son of the True and Living God, and the Savior of all mankind. All who are willing to accept Moroni’s promise and diligently read the pages of the Book of Mormon with sincere intent will come to know for themselves that the book is true.